Ankylosing spondylitis (AS) is a member of the family of spondyloarthropathies, which are inflammatory arthritides largely involving the axial skeleton and commonly accompanied by peripheral arthritis. Genetic factors, particularly the presence of HLA-B27, are major contributors to the susceptibility for AS. Despite some therapeutic advances, the treatment options for patients with AS and related disorders have been limited. 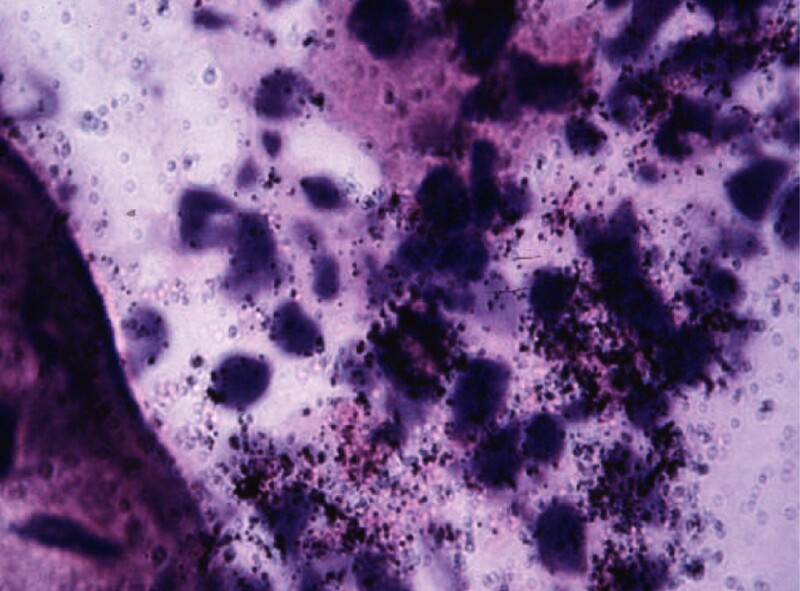 Several lines of evidence have led to the hypothesis that patients with AS might benefit from treatment with tumor necrosis factor (TNF). Specifically, TNF concentrations are known to be significantly elevated in the synovium of patients with rheumatoid arthritis (RA), in the inflamed gut of patients with inflammatory bowel disease, and in the inflamed sacroiliac joints of patients with AS. The anti-TNF agents have been shown to be of benefit in, and currently have indications for, RA (etanercept, infliximab, adalimumab), Crohn's disease (infliximab), and psoriatic arthritis (etanercept). Because the spondyloarthropathies share pathogenetic mechanisms with the above-specified disease states, studies have been conducted to evaluate the effectiveness of anti-TNF agents in several disorders, including AS. Data from clinical trials so far with infliximab and etanercept show that patients with AS and related disorders achieve significant improvement in clinical signs and symptoms based on validated outcomes measures. Computed tomography and magnetic resonance imaging (MRI) can facilitate the early diagnosis of AS. Studies with infliximab using MRI together with updated scoring methods demonstrated significant decreases in associated spinal inflammation. TNF antagonist therapy is well tolerated in patients with AS, with a side effect profile consistent with the prior experience of patients with RA. The spondyloarthropathies are chronic, autoimmune, inflammatory joint diseases that are second in prevalence to rheumatoid arthritis (RA) among the rheumatic diseases [1, 2]. The seronegative (that is, negative for autoantibodies) spondyloarthropathies include ankylosing spondylitis (AS), psoriatic arthritis, Reiter's syndrome (reactive arthritis), arthritis associated with inflammatory bowel disease, and undifferentiated spondyloarthropathies . A special study group/committee of pathologists of the European League Against Rheumatism has recommended the term spondyloarthritides on the basis of the inflammatory nature of these rheumatic conditions . AS, the prototypical spondyloarthropathy, is an often painful disorder that impairs physical functioning and can lead to lost productivity, loss of employment, and impaired quality of life [5–7]. Patients with AS have a 1.5–4-fold increased risk of death from a variety of disorders including circulatory diseases, amyloidosis, fractures of the spine, gastrointestinal diseases, and renal disorders [8–10]. Prevalence varies with ethnic origin and is highest among Native Americans living along the Pacific Coast and among Eskimos . Genetic factors are the major contributor to AS, and although the disease seems to be polygenic, the antigen HLA-B27 is present in at least 75% of patients with AS [3, 12, 13]. AS is believed to result from the generation of cytokines by antigen-stimulated T cells. Pathologic changes consist of an enthesopathy with edema and mononuclear cell infiltration at the contact sites between bones and ligaments or tendons . Synovial tissue of the involved joints demonstrates the proliferation of synovial lining cells, a mononuclear cell infiltrate that can include large numbers of plasma cells, and superficial fibrin deposition . Immunohistochemical techniques show dense cellular infiltrates consisting predominantly of T cells and macrophages in the sacroiliac joints of patients with AS . Large amounts of mRNA specific to tumor necrosis factor (TNF), a proinflammatory cytokine, are found in sites of bony remodeling in these patients, as demonstrated by in situ hybridization analysis (Fig. 1) . Elevated concentrations of TNF mRNA are found in the synovial tissue of patients with RA [17, 18], in the inflamed gut of patients with Crohn's disease (CD) , and in the inflamed sacroiliac joints of patients with AS [16, 20]. TNF antagonists have proved successful in the management of RA and CD. Given that TNF mRNA concentrations are elevated in the sacroiliac joint in patients with AS, it seemed logical to test the hypothesis that TNF antagonists could improve outcomes in patients with AS. This paper briefly reviews the conventional therapies for managing AS and focuses on the evolving role of the TNF antagonists infliximab and etanercept in the management of AS in patients. The clinical manifestations of AS include inflammation, back pain – which usually presents at the thoraco-lumbar junction – and stiffness. The stiffness is worst first thing in the morning, or with prolonged inactivity, and patients characteristically report improvement with activity. Although AS is traditionally considered a disease of the axial skeleton, arthritis of the appendicular skeleton is also common. Examination demonstrates reduced extension and right and left lateral bending, and flexion is reduced with later disease [21, 22]. Patients may also have decreased chest expansion and pain and/or tenderness over the sacroiliac region or the buttocks. Involvement of the hip, knees, and shoulders may also be detected in about 60–80% of patients [23, 24]. Although patients with mild AS are often able to maintain full physical function, the presence of moderate-to-severe disease can significantly limit employment, daily activities, and quality of life [6, 25]. Until recently, treatment options for AS were limited. This was related to two factors: chronicity of the disease before diagnosis, and lack of therapeutic agents that could provide anything more than symptomatic relief. Traditional treatments have consisted predominantly of physical therapy plus the administration of nonsteroidal anti-inflammatory drugs (NSAIDs) to decrease joint pain and morning stiffness [26, 27]. Physical therapy and exercise can significantly improve range of motion and relieve symptoms; regular physical conditioning and back exercises may also help . However, most patients with active disease require regular analgesia, often with NSAIDs [27, 29]. Selective cyclo-oxygenase-2 (COX-2) inhibitors, such as celecoxib, are effective analgesics and may decrease the potential risk of NSAID-induced gastrointestinal enteropathy . Chronic administration of systemic corticosteroids is not recommended, because they are rarely effective and serve to promote decreased bone mineral density, although injection of a long-acting corticosteroid into painful sacroiliac joints may relieve pain in patients whose symptoms are refractory to NSAIDs . The disease-controlling antirheumatic therapy or disease-modifying antirheumatic drugs sulfasalazine and possibly methotrexate may have some efficacy, particularly in patients with appendicular involvement [32–34]. Because TNF mRNA has been detected in the inflamed gut and sacroiliac joints of patients with chronic inflammatory bowel diseases and spondyloarthropathies, including AS, this suggested an opportunity to investigate the efficacy of TNF antagonists in these diseases . Because adalimumab has only recently become available in the USA, most of the clinical investigations have been conducted with etanercept and infliximab. Currently, in addition to RA, etanercept is approved in the USA for use in psoriatic arthritis, whereas infliximab is indicated for CD [3, 36, 37]. Although etanercept and infliximab are both anti-TNF inhibitors, they differ in several ways. First, etanercept binding is restricted to the trimeric form of soluble TNF, whereas infliximab binds to both monomer and trimer forms. Second, etanercept forms relatively unstable complexes with soluble TNF, resulting in the release of dissociated TNF, whereas infliximab forms stable complexes with soluble TNF. Third, more infliximab molecules bind to transmembrane TNF, and with a higher avidity than etanercept . Knowledge of binding characteristics differences may explain some of the differences seen with infliximab and etanercept in Crohn's disease, a member of the spondyloarthropathy family. For example, infliximab has been shown to be effective in both short-term  and long-term  clinical trials in CD, and to continue these benefits with maintenance infliximab treatment, but the efficacy of etanercept in CD, in a well-controlled randomized trial, has not been demonstrated [35, 41]. With infliximab, 573 patients with active CD who continued infliximab after an initial response to a single infusion were more likely to be in remission at weeks 30 and 54, whereas results from the study by Sandborn and colleagues  showed no statistically significant difference between the percentage of etanercept-treated patients and that of control-treated patients who showed improvement at 4 weeks on the CD Activity Index (39% versus 45%, P = 0.763, respectively). Factors postulated to be responsible for these differences include the following: the maintenance of stable neutralizing complexes with TNF ; the accessibility of involved tissues to the agent depending on the administered dose; the potential role of other cytokines, such as lymphotoxin-α, in certain disease processes; the concentration of TNF in the involved tissues; and the relative sensitivity of affected tissues to the effects of TNF . It is important to state that whereas these differences exist in CD, there are no direct comparisons in CD or in AS. Whether the differences in CD translate to differences in AS is not yet known. We now turn our attention to patients with AS and a review of some of the early and pivotal trial data with these agents. Gorman and colleagues  conducted a double-blind, placebo-controlled trial to evaluate the effectiveness of etanercept in 40 patients with active, inflammatory AS. Patients were randomized to receive etanercept 25 mg subcutaneously twice weekly or placebo for 4 months, with the opportunity to participate in a 6-month open-label extension in which all patients would receive etanercept . The primary outcome measure was a composite treatment response of 20% or more in at least three of five measures of disease activity, which is similar to the criteria defined by the Assessments in Ankylosing Spondylitis (ASAS) Working Group  – duration of morning stiffness, degree of nocturnal spinal pain, the Bath Ankylosing Spondylitis Functional Index (BASFI) , the patient's global assessment of disease activity, and the joint swelling score – with no worsening in any measure. At the end of 4 months, treatment response was originally reported in 80% of etanercept-treated patients versus 30% of controls (P = 0.004) . A subsequent re-analysis corrected this to 75% instead of 80%, with a corrected P value of 0.01 by Fisher's exact test (two-tailed) . Other results at 4 weeks included changes in physicians' global assessment of disease activity (-31.5 with etanercept versus +7.5 with placebo, P < 0.001), patients' global assessment of disease activity (-1.0 with etanercept versus 0 with placebo, P < 0.001), BASFI (-2.3 with etanercept versus -0.1 with placebo, P < 0.001), erythrocyte sedimentation rate (ESR) (-26.0 mm/h with etanercept versus -3.5 mm/h with placebo, P < 0.001), and C-reactive protein (CRP) (-1.3 mg/dL with etanercept versus +0.5 mg/dL with placebo, P = 0.003), where lower scores represent better outcomes for all measures evaluated. With regard to spinal mobility, one measure showed significant improvement (greater chest expansion by 0.9 cm at 4 months with etanercept versus less expansion by 0.2 cm with placebo, P = 0.006), whereas no statistically significant difference was seen for two measures at 4 months: modified Schober's index (P = 0.26) and occiput-to-wall measurement (P = 0.11). This may have been due to spinal ossifications related to prolonged disease. The measure of enthesitis used in this study, the modified Newcastle Enthesis Index [47, 48], showed significant improvement after 4 months (-4.5 with etanercept versus -1.5 with placebo, P = 0.001), although the authors suggest that the measure requires further study . In terms of overall efficacy, the authors concluded that etanercept produced a rapid, significant, and sustained response in the initial phase of the study . The 6-month open-label phase that followed showed that etanercept sustained clinical benefit in terms of percentage of patients achieving an ASAS 20% response up to the end of the study (Fig. 2) [42, 43]. Etanercept was well tolerated, with five injection-site reactions (versus one with placebo) and 10 cases of upper respiratory infections (versus 12 with placebo) being the most commonly reported adverse events . Other adverse events included tinnitus and muscle fasciculations of eye and thigh muscles reported in one etanercept-treated patient, and the development of a positive antinuclear antibody titer of 1: 80 in one etanercept-treated and one placebo-treated patient. Percentage of patients in each study group who had a treatment response. A treatment response was defined as 20% or greater improvement in at least three of five outcome measures (duration of morning stiffness, degree of nocturnal spinal pain, the Bath Ankylosing Spondylitis Functional Index, the patient's global assessment of disease activity, and the score for joint swelling). 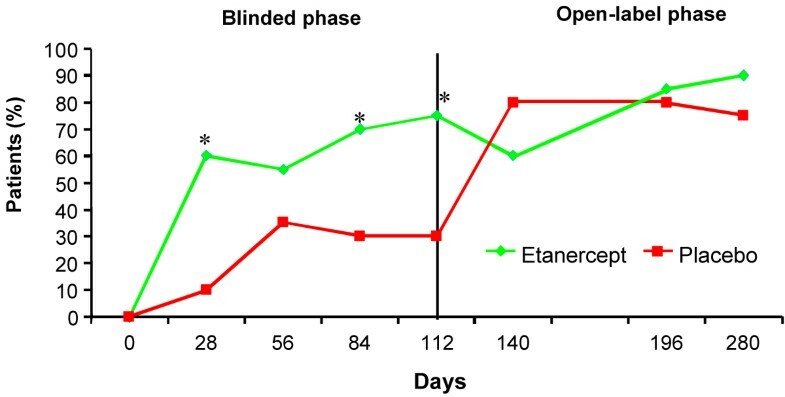 The patients in the etanercept group received etanercept throughout the 10-month study period; those in the placebo group received placebo for 4 months, followed by etanercept for 6 months. The differences between the groups were statistically significant at month 1 (P < 0.001), month 3 (P = 0.03), and month 4 (P = 0.004). During the open-label portion of the trial, there were no statistically significant differences between the two groups. Reproduced with permission from . Copyright © 2002 Massachusetts Medical Society. All rights reserved. Note that subsequent reanalysis of the data the end of 4 months corrected the P value to 0.001 . In another placebo-controlled, double-blind, 24-week trial of etanercept, 30 patients with proven, active AS were randomized to initially receive etanercept 25 mg subcutaneously twice a week or placebo for 6 weeks . After 6 weeks, the placebo-treated patients were crossed over to receive etanercept for 12 weeks, and the etanercept-treated patients were continued on medication for an additional 6 weeks. Primary outcome measures were indices of disease activity including the Bath Ankylosing Spondylitis Disease Activity Index (BASDAI) , the BASFI, pain, quality of life (measured by the Short Form-36 [SF-36]) , and concentrations of CRP . By definition, responders showed a 50% or more improvement in the BASDAI score. Results at 6 weeks showed a 50% BASDAI response in 57% of etanercept-treated patients versus 6% of controls (P = 0.004) . Similar results were reported in the patients who switched to etanercept after 6 weeks of placebo. Significant improvements were also seen in physical function (P < 0.05) and mean concentrations of CRP (P < 0.001). No severe adverse events or major infections were reported. To evaluate the effectiveness of infliximab in patients with AS, an open-label pilot study was conducted in which 11 patients with AS of short duration (median 5 years) and active disease for at least 3 months were administered three infusions of infliximab 5 mg/kg intravenously at weeks 0, 2, and 6 . Follow-up assessments were made at weeks 1, 2, 4, 6, 8, and 12. Outcome measures included BASDAI, BASFI, pain as measured on a 10-cm visual analog scale (VAS), and the Bath AS Metrology Index (BASMI), which is used to assess spinal mobility [52, 53]. Laboratory markers (such as CRP, ESR, and interleukin-6) were monitored, and dynamic magnetic resonance imaging (MRI) was performed in five patients. Of the 11 patients at study entry, 10 continued until completion of the study at 12 weeks, with all showing a marked improvement in all parameters compared with baseline (based on median values): BASDAI (2.4 versus 6.5, P = 0.004), BASFI (2.4 versus 5.3, P = 0.008), BASMI (1.5 versus 3.0, P = 0.1), VAS for pain (2.5 versus 7.8, P = 0.004), CRP (less than 6.0 versus 15.5 mg/L, P = 0.008), and ESR (<15.0 versus 32.0 mm/h, P = 0.008) . Median interleukin-6 concentrations also declined from 12.4 mg/L at baseline to less than 5 mg/L at week 12. Subjective improvement was noted as early as 1 day after the initial infusion, with the positive effect persisting until week 12. Three of five patients had MRI-revealed spinal inflammation at baseline, which improved in two of the three patients 2–6 weeks after the third infusion. This study gave a very positive early indication that anti-TNF therapy is effective in the management of AS over the short term. The successful results of the 12-week open-label phase led to an extension phase in which patients were to be given up to three additional infusions of infliximab 5 mg/kg in cases of relapse . The median total observation period for the open-label phase was 39 weeks (range 35–41 weeks); by the end of the study, six patients had received all three additional infliximab infusions. The data from this study, which was the first to report on the long-term (approximately 1 year) management of active AS with infliximab, showed that the improvement elicited by a loading regimen of three infliximab infusions could be maintained for up to about 7 weeks before the first symptoms reappeared . Dosing data suggested that infliximab infusions might be needed every 6 weeks to achieve sustained improvement in patients with active AS. A placebo-controlled 12-week study involving 70 patients with active AS was conducted to assess the effectiveness of infliximab in AS . The patients were randomized to receive either infliximab 5 mg/kg at weeks 0 (baseline), 2, and 6, or placebo. Efficacy parameters included validated clinical criteria from the ASAS working group  (namely BASDAI, BASFI, BASMI, and SF-36 for quality of life). The primary end point was a 50% improvement in disease activity, as determined by BASDAI, at the study's end (week 12). Intention-to-treat analysis showed more patients meeting the primary end point (BASDAI 50%) with infliximab than with placebo (53% versus 9%, P < 0.0001) . Throughout the 12-week treatment period, infliximab was shown to be effective in terms of the percentage of patients achieving response for all the response criteria used: BASDAI 20% (P = 0.001), BASDAI 70% (P = 0.045), ASAS 20% (P = 0.0007), ASAS 50% (P < 0.0001), ASAS partial remission (P = 0.005), BASFI (P < 0.0001), and BASMI (P = 0.0023). Infliximab demonstrated effects on peripheral arthritis and enthesitis. At baseline, 44% of patients in the infliximab group had both conditions active; by week 12, only 17% had peripheral arthritis and 27% had enthesitis. No change was noted in the placebo-treated patients for arthritis (P = 0.249) or enthesitis (P = 0.81). As for the SF-36 data, infliximab significantly improved the physical component score, whereas placebo did not (P < 0.0001). The 67 patients in both treatment groups who completed the study were enrolled in a 1-year open-label extension phase in which the controls were treated with infliximab 5 mg/kg intravenously and then received infusions every 6 weeks until week 54 . The magnitude of the response at 12 weeks was sustained until week 54, with improvement reported in every outcome measure that was evaluated: BASDAI, BASFI, pain by VAS, quality of life by SF-36, and CRP . 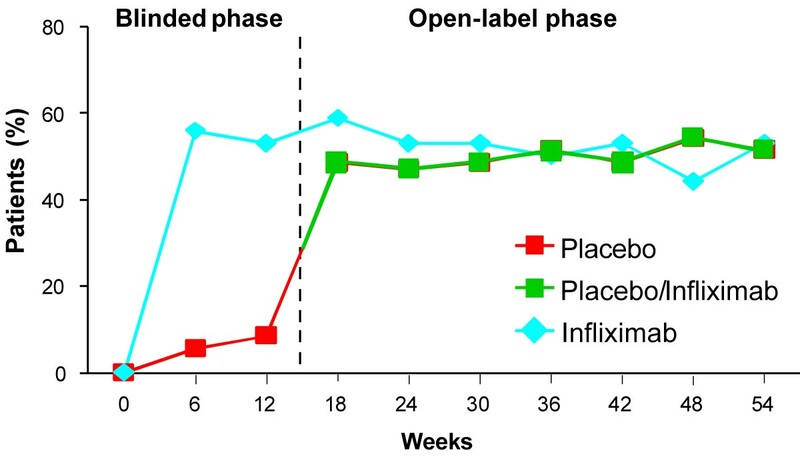 Figure 3 illustrates the percentage of infliximab- and placebo-treated patients who attained 50% BASDAI improvement from baseline through to week 54. Data at 6 weeks after those initially treated with placebo were switched to infliximab were 56% for infliximab, in comparison with 49% for the placebo group (P value not significant), demonstrating rapid response once the placebo group received the active drug . By the end point of the study, 54 patients completed the course (more than 75%); 16 patients dropped out. An analysis of completers confirmed a continuous decline in disease activity based on BASDAI (means ± SD are shown): 6.5 ± 1.3 at week 0, 3.2 ± 1.8 at week 12, and 2.5 ± 1.8 at week 54. This study demonstrated that infliximab remains efficacious in active AS over a 1-year treatment period. Other aspects of infliximab therapy in patients with AS have been investigated. An open-label study by Stone and colleagues (21 patients enrolled; 18 patients evaluated at week 14) was conducted to determine whether infliximab (5 mg/kg intravenously for 2 hours at weeks 0, 2, and 6) is an effective treatment for patients with AS who have not responded satisfactorily to conventional therapy and to identify whether there are any baseline clinical and imaging correlates of response to treatment with infliximab in AS . Measures taken at baseline and with each subsequent visit included nine functional variables (for example BASDAI, BASFI, and Health Assessment Questionnaire), six clinimetrics (for example chest expansion and finger-to-floor distance), and laboratory inflammatory markers (for example ESR, CRP, and haptoglobin); MRI scans before and after infusions were performed in a subset of nine selected consecutive patients. Results showed that by week 14 there was more than 60% improvement in functional variables, selective improvement in clinimetric scores (for example chest expansion, P < 0.021), and significant improvement in inflammatory markers, which were maintained from week 6. MRI findings showed improvement in the patients examined during the imaging cohort and demonstrated a reversal of inflammatory changes with infliximab as early as weeks 2–4. Other key findings were the identification of two groups of responders to infliximab (marked responders and not so marked responders), an absence of correlation between treatment response and baseline inflammatory markers, and a positive benefit with infliximab even in patients with advanced AS (as all patients in this study had high baseline BASDAI scores). Maksymowych and colleagues, in a prospective observational and inception cohort analysis, evaluated the efficacy and tolerability of infliximab in 21 patients with NSAID-refractory AS seen in both university-based and community-based practice . The patients in this study, who were seen from April 2000 to October 2001, were given infliximab at a dose of 3 mg/kg intravenously at weeks 0, 2, and 6, and at 2-month intervals thereafter. Data collected (at baseline, at week 14, and at the earlier of year 1 or withdrawal) included patient demographics, Bath AS indices (for example BASDAI, BASFI, and BASMI), laboratory markers (for example ESR and CRP), and adverse events or reasons for withdrawal; dynamic MRI with gadolinium enhancement was also done for the first six consecutive patients. Efficacy data from 17 patients assessed at week 14 included the following significant results: mean BASDAI improvement from baseline (P < 0.001), 43% reduction in mean BASFI (P < 0.001), 55% reduction in mean ESR (P < 0.001), 63% reduction in mean CRP (P = 0.01), and reduction in maximal rate of MRI-defined gadolinium augmentation (P = 0.04). The study demonstrated the effectiveness and tolerability of infliximab, even when used at a lower dose than used previously in AS studies, to manage both axial and peripheral joint disease in patients with AS. In addition to its demonstrated efficacy in AS, infliximab has been shown to be effective in patients with other types of spondylarthritides. Van den Bosch and colleagues evaluated the efficacy and safety of infliximab in a 12-week placebo-controlled clinical trial involving 40 patients with active spondyloarthropathy (AS with axial disease, AS with peripheral arthritis, psoriatic arthritis, undifferentiated spondyloarthropathy) . Patients were randomized to receive either placebo or infliximab 5 mg/kg on weeks 0, 2, and 6. Primary outcome measures were improvements in patient and physician global assessments of disease activity on a 100 mm VAS. Study results showed a statistically significant difference in favor of infliximab for the primary outcome (global disease assessments) and significant reductions in ESR and CRP as early as week 2 and sustained up to week 12. For the peripheral disease assessments, infliximab led to significant improvements at week 12 for all outcomes (morning stiffness, P = 0.038; peripheral joint pain, P = 0.002; tender joint count, P = 0.015) except swollen joint count (P value not significant). For axial disease assessments, statistically significant improvements in favor of infliximab were seen for morning stiffness (P = 0.006), spinal pain (P = 0.002), BASDAI (P = 0.002), and BASFI (P = 0.041). Given the limited numbers seen with psoriasis and differences in baseline Psoriasis Area and Severity Index, no conclusions could be drawn for any psoriasis-specific effect. Overall, this study demonstrated that infliximab is efficacious in various spondyloarthro-pathies, including and other than AS. Imaging techniques such as computed tomography (CT) and MRI might extend the sensitivity of conventional radiologic procedures in the diagnosis of early AS. CT can detect early bony erosions, whereas MRI is particularly sensitive to inflammatory changes in the soft tissue and bone marrow (Fig. 4) . The sensitivity of MRI techniques can be enhanced with the use of contrast materials such as gadolinium. Fat-saturation techniques such as the Short-Tau Inversion Recovery method can be used to characterize the acute spinal inflammation of active AS [61, 62]. Magnetic resonance images of a normal spine (left) and spinal inflammation in a patient with ankylosing spondylitis (right). Reproduced with permission from Elsevier . 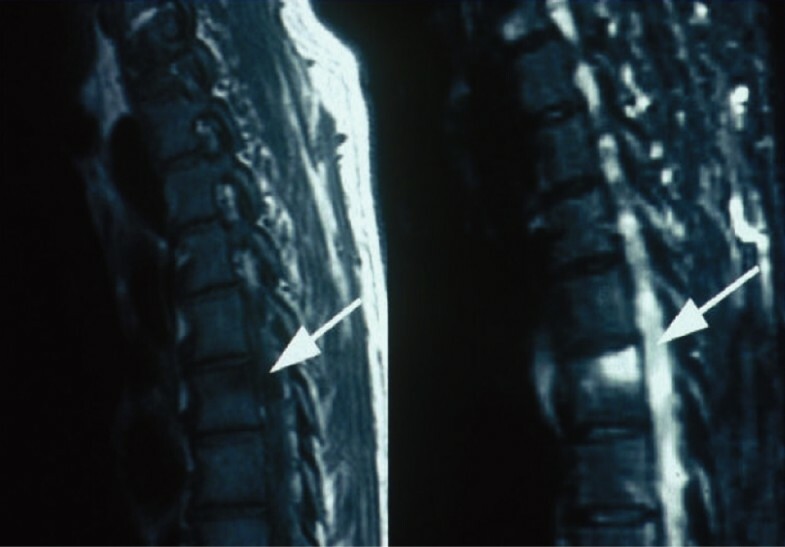 On the basis of the MRI results, the acute spinal lesions of AS can be evaluated by the MRI Scoring System for Spinal Inflammation in AS (ASspiMRI), an updated system in which each of 24 vertebrae (C2 to S1) is graded on a six-point scale that measures degree of edema, extent of bone erosions, inflammation, and chronicity . Braun and colleagues employed this system in a study examining the effects of infliximab 5 mg/kg in 20 patients with active AS . The infliximab-treated patients showed a 60% improvement in Short-Tau Inversion Recovery scores over 3 months (P = 0.01), whereas the controls showed a 21% deterioration from baseline (P = 0.5). Improvement in MRI scores with infliximab was significantly correlated with clinical improvement in BASDAI scores (P < 0.03). In patients with active AS, anti-TNF therapy with infliximab and etanercept has been shown to result in clinically important benefits, as assessed with validated outcomes measures. MRI studies demonstrate that improvements in clinical parameters are accompanied by decreased structural manifestations of disease. Future trials need to delineate predictors of optimal patient response to anti-TNF therapy, optimum dosing schedules, and the role of combination therapy to enhance clinical benefit. Whether TNF antagonist therapy alters the natural history of AS remains an important research priority. Early therapy could then prevent the associated disability and economic consequences of AS. The transcript of the World Class Debate for ACR 2002 has been published electronically in Joint and Bone. This article, and others published in this supplement, serve as a summary of the proceedings as well as a summary of other supportive, poignant research findings (not included in the World Class Debate ACR 2002). PMP is or has been a consultant for Amgen, Wyeth, Centocor, Ortho-McNeil, Pfizer and Merck, and has received grant support from Amgen, Wyeth, Abbott, Centocor, Genetech, Ortho-McNeil, Pfizer and Merck. JB has received honoraria for consultation from Centocor, Schering Plough, Amgen, Wyeth and Abbott.